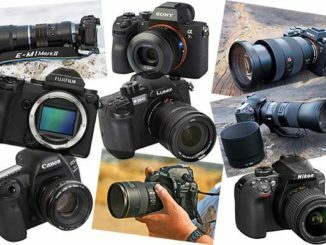 Now that we’ve had gimbal stabilizers for a few years, they’ve become an indispensable part of the filmmaker quiver, completely changing the game on how shooting film and video on the run works. But mobile and action filmmakers have wanted to get into the game, and so smaller, handheld models have started becoming a staple as well. 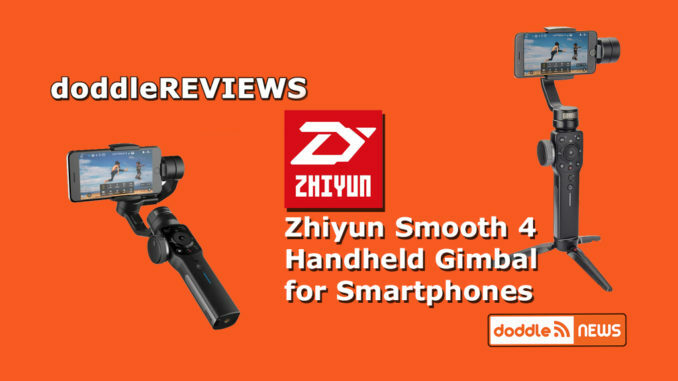 One interesting model on the scene is the Zhiyun Smooth 4 handheld stabilizer for smartphones. And it’s got enough features to keep a mobile filmmaker running for days. 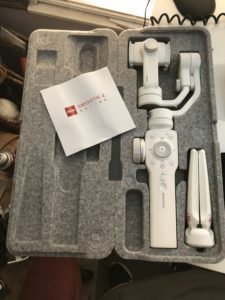 Taking a look at the Smooth 4 straight out of the box, I am happy to see that Zhiyun has followed the trend of packaging their gimbal in a lightweight, but the sturdy foam case, which can continue to be used to house the unit when not in use. I would have preferred to have a handle, and some boxes like this even have a lock. But you can’t have everything. It’ll be a sturdy and protective place to keep your gimbal when you aren’t running and gunning. And that’s a good thing. Inside, nestled snugly in its form fitting sections, the Smooth 4 sits, with accessories including a mini tripod stand, USB c cable, and instructions. The tripod is well built, but light enough that the user could keep it on during use, and then deploy it as a stand when your arm gets tired of holding it. It’s three legs pull out wide enough, so that the center of gravity is low, preventing the Smooth 4 from tipping over, even when nudged. Good design. The tripod mount also means that you can add a monopod to the mix, and then get some additional distance to create a nice crane shot. I like this idea, especially coupled with an object following feature mentioned below. 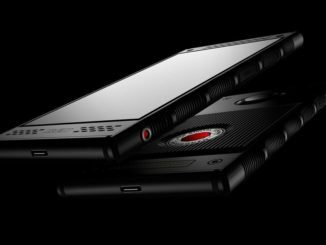 The Smooth 4’s three axis array is very similar to DJI’s OSMO 2 Mobile, in that you can slip in your smartphone, and then adjust the clamps right or left to get the phone in balance with the gimbal itself. You simply turn it on, place the phone facing downwards, and then nudge the clamp array forwards and backwards until it reaches equilibrium. It takes a few seconds, even between multiple phone models. I adjusted the Smooth 4 with both a Samsung GalaxyS8+ and the iPhone X, and was shooting with both in less than a minute. From there, you can also adjust the Smooth 4 to shoot in landscape or in vertical mode (which we all know is evil right?). Additionally, there is a locking mechanism inside the gimbal cradle, which will lock it down when not in use. You simply place the cradle back in the home position, turn it off, and it locks down to keep the system secure. You can also turn the smartphone to portrait position and it will go in standby mode until you’re ready to shoot again, saving battery life. Taking a look at the controls, there are buttons for the menu, display, record, still photo, centering, and then a jog wheel to adjust and zoom the image. Very similar in concept to the DJI OSMO 2 Mobile. But where the Smooth 4 stands out is that on the left is a turn wheel, that enables the shooter to follow focus as you move, giving it a very nice dolly zoom capability. Coupling that with the focus control, and suddenly, you’re shooting the vertigo zoom shots that made both Hitchcock and Spielberg’s imagery so iconic. ON A SMARTPHONE. One thing that happened, however, is that when I accidentally turned it back on without a phone, it shook violently and the zoom knob popped off. But it popped right back on. The knob even came off in my hand once or twice. Surprising that it isn’t permanently fixed to it. Users can also change the modes to either panning mode, or lock mode. Panning will enable you to pan left or right, while keeping the smartphone level, while the lock mode will lock down the smartphone as you move the gimbal in just about any direction. There’s also a Go mode, which will allow you to follow a subject quickly if there’s a lot of movement in your shot. The Smooth 4 claims it can also shoot inverted, so you can turn it upside down, and it will work just as well for those lower angle shots. But transitioning from regular to inverted is a bit dicey, and every time I tried it, the recording stopped. There is also a long trigger rocker switch on the back to control other modes including smooth up, down, left and right movements. Hold down the trigger, and you can adjust the speed of which the gimbal will move in any direction. The upper portion controls the up/down speed, while the lower half controls left/right. To reset, you just press one of the buttons twice and it goes back to it’s default gimbal settings. Lastly, there’s even a central flash button to turn on your phone’s LED light, and a button to switch between front and back cameras to take those ultra smooth selfie videos when you’re moving. Now that we’ve walked around the Smooth 4, it’s time to talk about the Zhiyun’s app. Available in both iOS and Google Play, the ZY Play app connects pretty quickly. There’s a QR code on the bottom of the phone clamp, which you scan to connect, or select the device from the menu. The weird thing here is that after you connect, the connect menu stays up, making you think that the connection may have failed. Don’t be fooled. You’ll see a check by the Smooth 4 wifi, then you just press “Camera” at the bottom and you’re ready to shoot. There’s also a phantom power cord, which enables you to plug in your smartphone and charge it while using. But it uses a microSD plug, meaning that option is only going to be beneficial to Android users. Sorry, iOS, no lightning support without an adapter. The Smooth 4 also has a 500 gram weight and balance limit, so if you want to add an additional lens, like from Moment’s Mobile Filmmaking Kit, it’s not going to throw off the calibration of the gimbal, forcing you to make a choice. That’s very nice. From within the app, you can adjust all your camera settings manually, very much like FiLMiC Pro, as well as having touch control over the gimbal itself. The camera app is very easy to use, though I did experience a disconnect once, prompting me to have to reconnect via WiFi on the iPhone. It hasn’t happened since, nor has it happened on the Android side. I talked to Zhiyun about it and they reported no other issues pertaining to the WiFi dropping out, so I’m going to call it a the fault of the iPhone’s WiFi for now. The app is as easy to use as FiLMiC or any other camera app, and the image quality can be adjusted to everything from 720p to 1080p (no 4K). But I’ve read that the zoom function doesn’t work very well on the Android platform, and the motion time-lapse seems to have issues as well. The Smooth 4 isn’t supported by FiLMiC Pro either. That’s unfortunate, though to be fair, as of this writing, FiLMiC Pro doesn’t support the OSMO 2 either. Is that the fault of FiLMiC or Zhiyun? I don’t know. Maybe a little of both. But being stuck with just one camera app option is a downer. Come on, guys, get together. Share your SDK and let’s solve that problem! One really cool feature is object tracking. You can draw a box around your subject, and the Smooth 4 will then track on that box and smoothly move with it. Very nice. You may notice that the smoothness of the image quality is pretty nice while walking up the stairs, but it’s not perfect. It doesn’t fully dampen out your footsteps, but that is true of all stabilizers. It gets you most of the way, but users need to learn “gimbal walk” in order to get rid of the bounce completely. So, what are my overall impressions of the Zhiyun Smooth 4 gimbal stabilizer? 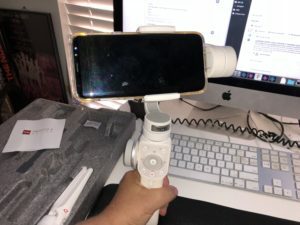 Well, when I bought the DJI OSMO 2 Mobile, I was convinced there couldn’t be a better gimbal out there. But with the Smooth 4, I see a handheld gimbal that is at least comparable, depending on which phone you’re going to put in it’s sling. It’s not perfect mind you. As stated, it can’t take out a lot of the vibrations from walking, and there is no removable battery. Battery life promises 12 hours, depending on the weight, but I would imagine that’s in ideal conditions. More like a half or two thirds that is practical. It would be nice to be able to swap out batteries and keep going, but as it stands you have to recharge the gimbal, which can take up to four hours. Android users need to be sure that their model is fully supported before buying, as some simply won’t work. For instance, some phones won’t be able to shoot in 4K, with the app defaulting to shooting in 1080p. That isn’t the case with the iPhone, however, which is fully functional, with one exception. The iPhone keeps defaulting to autofocus, so you can’t use manual focus very well. I’m thinking that more Apple’s fault, though, rather than Zhiyun’s. Will I sell my OSMO 2 in favor of it? No. To be honest, I spent all my time trying to keep the smartphone on target, as the stabilizer tends to drift … A LOT. I blame the app for the Smooth 4’s shortcomings, which become more apparent the more you use it. 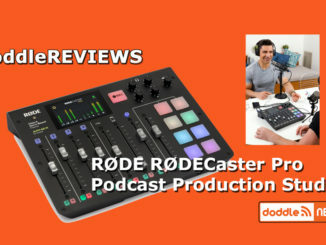 Its a pity, because for $139 it had a lot of promise for Mobile filmmakers. But it can’t even record in 4K! Again, the app is killing this device’s potential. 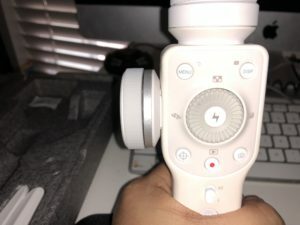 Zhiyun needs to spend more time developing the app and locking down the basics, so that the killer features like the zoom wheel can really shine. As it stands, it needs a serious update of the app and firmware to make the device workable in any appreciable fashion. They updated the software in December. Have you tried it out again? Is it Now something worth buying? That’s certainly possible. Firmware updates could solve most of the problems I had with it. Let us know!